The Apioceridae is small family of mostly rather large flies, in Australia represented by the single genus Apiocera, with 67 described and many undescribed species. 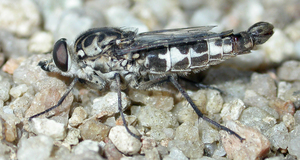 Adult Apiocera are strong, noisy fliers, and occupy a wide range of habitats, from sea beaches and desert to forests at high altitudes; at least half of our known species are associated with relatively arid conditions. Although essentially flower-feeders, they are usually found resting on the ground.